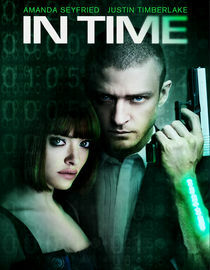 In Time, with Justin Timberlake is surprisingly good. Not great. But, good. The movie, at times, reminded me of Logan's Run, Bonnie & Clyde and Robin Hood. But, the main theme was really the 99% versus the 1%. I found it timely given our discussions lately about class warfare. The most haunting line from the movie for me was "In order for a few to have immortality, many must die." The premise is interesting. Set in a world where time literally is money. You're guaranteed 25 years of life and are given one year in the bank. At the age of 25, you stop aging and your clock starts running down. The currency is time on your clock. Prices are set in minutes, hours, weeks, months and years. Will Salas is dirt poor, literally living day-to-day, when a man who is tired of being eternally 25 gives him a gift of over 100 years. What will Will do with all of this time? There are some holes in the plot. For example, if your life depended on having time on your clock, you'd probably not forget to have your deposit made. And, the system isn't nearly secure enough. People walk around with every second they have on their arm and anyone can simply take it from them. But, overlooking those flaws, I'd give the movie a solid three out of five stars. I liked it too Brian. LOL, the thought of being 25 forever (physically anyway) is more attractive to me with every birthday.